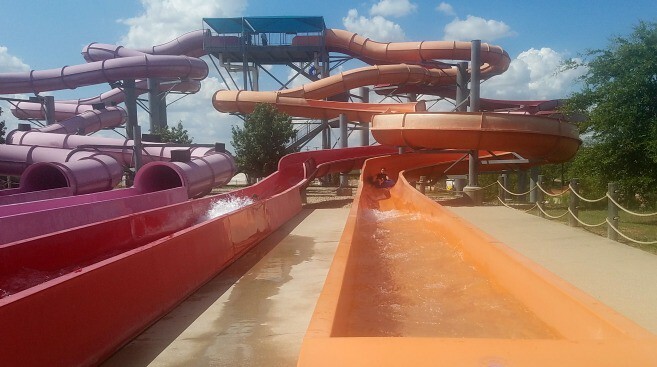 This post was brought to you by Hawaiian Falls. All opinions are mine. It is hard for me to believe that July is almost over. 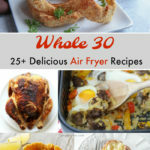 Life seems to be flying by these days, but the kids still need things to do or else we all go nuts in the house. 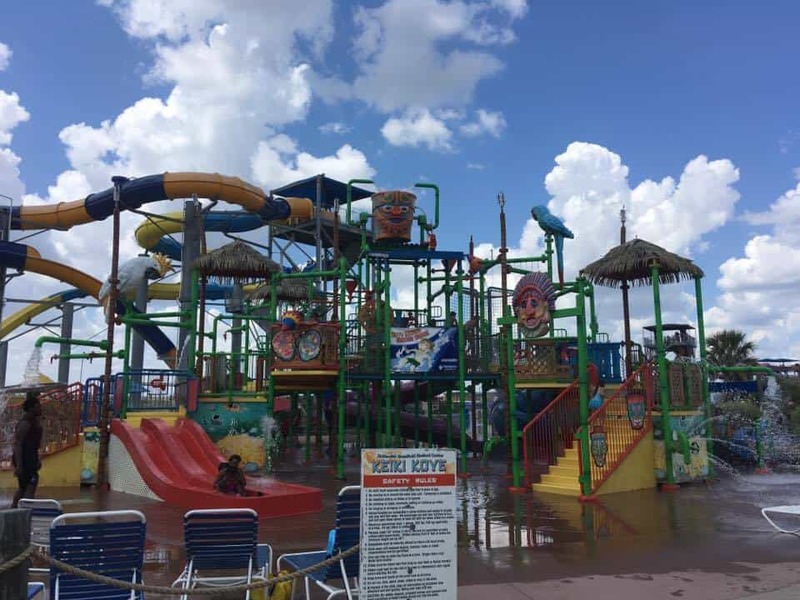 The hot Texas sun persuades us to stay inside, but outside at Hawaiian Falls is where the fun is at! 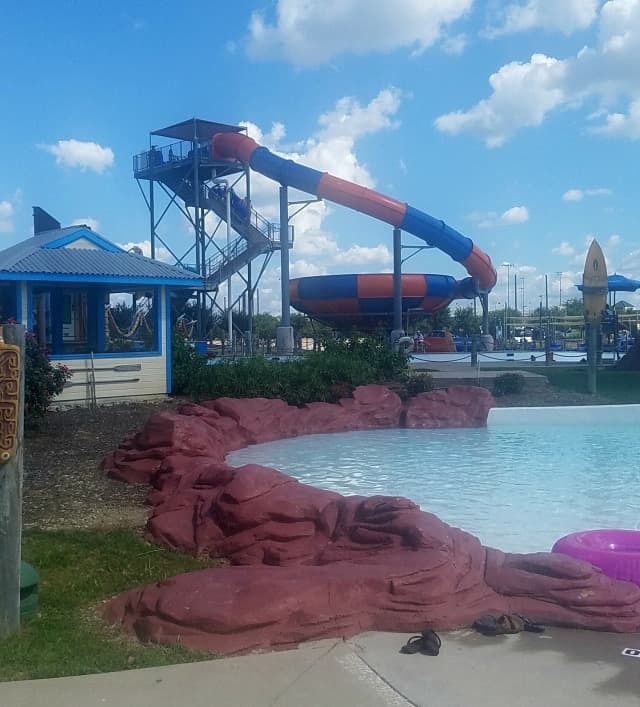 This is the place we spend most of our time while at Hawaiian Falls. There is a rope ladder, slides for toddlers, a wading pool and a swimming pool on the other side. This spot is where it was at for our family. And there is a shaded area, as well, so you can get out of the sun. 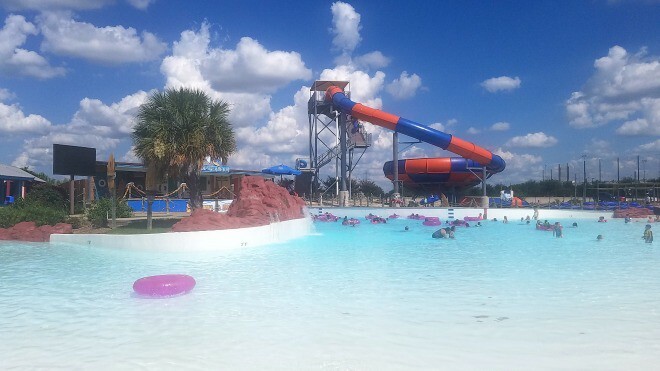 On our last visit to Hawaiian Falls, we spent quite a bit of time on the Lalana Peak Slides. Everyone has a different favorite color but mine was the red one, which is more open than the other slides. The three year old isn’t tall enough to ride these slides, but he probably will be next summer! 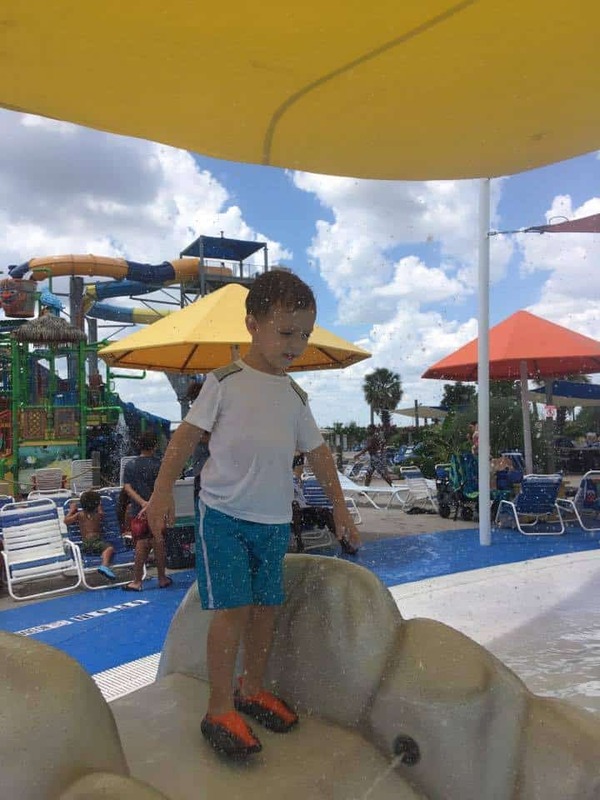 The three year old found his favorite slide at Keiki Kove, which is a world of fun water activity, just for the little ones. There are even slides that are just their size. His favorite here was the red one and he was so proud of himself for going down alone! The older boys and hubby went down the Hightide Whirlpool. You head down the slide and then swirl around the bowl before you get “flushed” out the bottom! I didn’t attempt this one, but they loved it! The Hawaiian Halfpipe is a 2 person raft ride that propels you both through a dark twist and then a sudden drop to the half pipe. This is a favorite amongst bigger kids and adults, too. 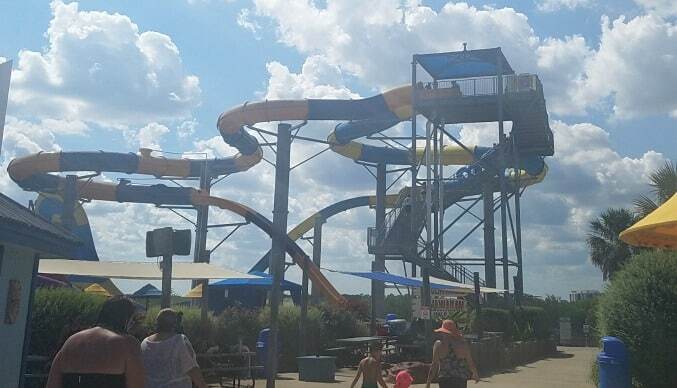 Other rides include the Cliffhanger, Pineapple Express, The Torpedo, and Tiki Tower Slides. Make it a point to hit all the rides and compare them to decide which one is your favorite! Between slides, the boys and I liked to relax a bit and recharge. The Kona Kooler is a continuous river where you can float and relax. Kids under 12 must be accompanied by an adult, but it is great for the whole family. Waikiki Beach is the Wave Pool at Hawaiian Falls. This is also a great place for families to relax together! 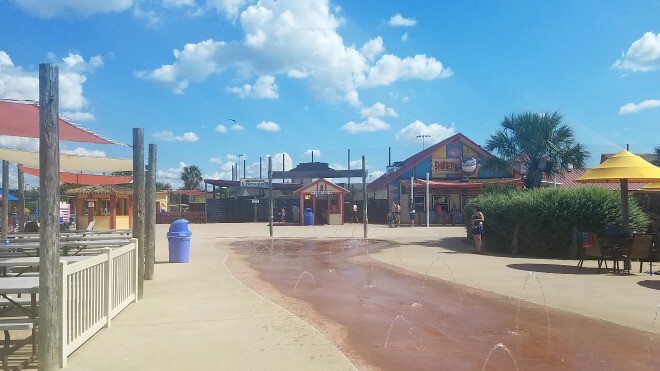 Hawaiian Falls was thinking of hot little feet when they created this little walkway with squirting water. It is prefect for babies to get a little wet or big kids with barefoot as they walk from one side of the park to the other. 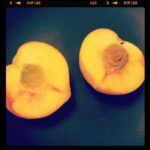 My boys have always loved this little part! 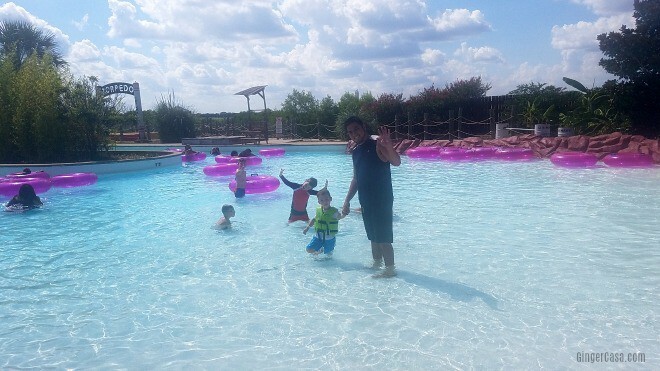 If you head to Hawaiian Falls, you will, of course, want to pack lots of sunscreen and sunglasses. They also have a way to get out of the sun and protect yourself, or just relax with the family. There are quite a few covered areas, like the picnic tables and chairs you see in the picture above, that are scattered throughout the park. 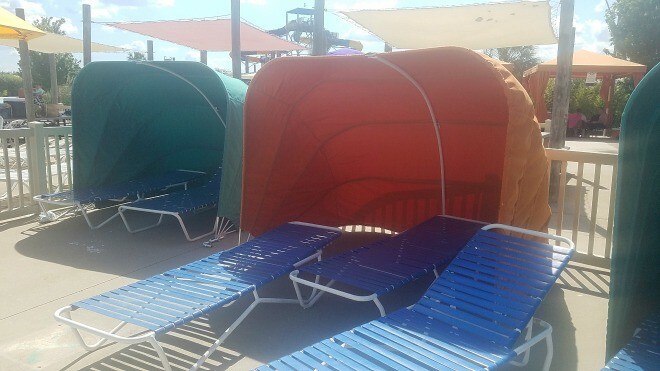 There are also different sized cabanas available to rent throughout the park. This was the perfect place for us to keep our things, and a cabana attendant who can get food or drinks. 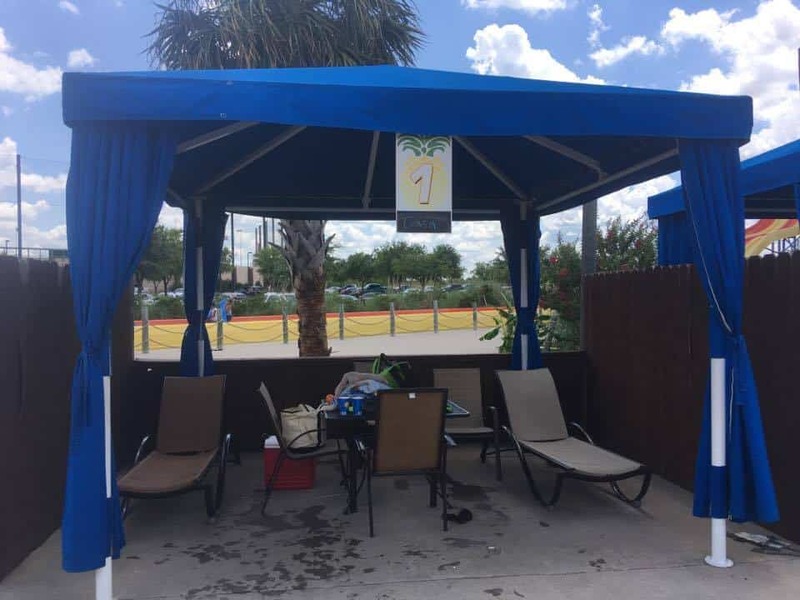 The cabanas come with four drink wristbands for unlimited drinks throughout the day. You can bring your own coolers for a $16 cooler pass fee, or you can enjoy some delicious brisket, hamburgers, hot dogs, pizza, nachos, pretzels, churros, or french fries. More options for kids include peanut butter and jelly sandwiches. There are also treats like Mini Melts, ice cream, Lemon Chills, and authentic Hawaiian Shave Ice. And of course you can stay hydrated all day with drinks available at Sharkey’s! 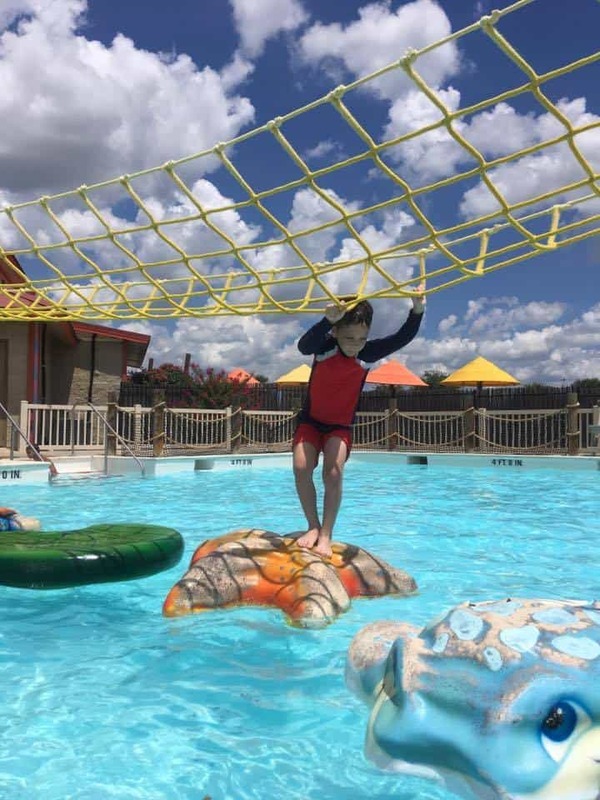 Visit HFalls.com for more information, hours, pricing, and more and have tons more fun in the sun this summer!